In 2002, Jean Williamson, Judie Ashbaugh, and Aimee Miller thought it was time that Ashe County had a quilt guild. Agreeing that this would be a wonderful thing for quilters in our county, they put out the word that an organizing meeting was scheduled. From that beginning, many quilters gathered and began the hard work of getting the guild up and running. The first officers were: President Judie Ashbaugh, Vice-President Jean Williamson, Secretary Janet Trembly, and Treasurer Pat Ware. In the following meetings, a name was picked, by-laws established, and Carrie McNeill designed the logo. With much hard work and attention to detail, the charter members all contributed to making the guild what it is today; a place where people can come together to share their love of quilting. 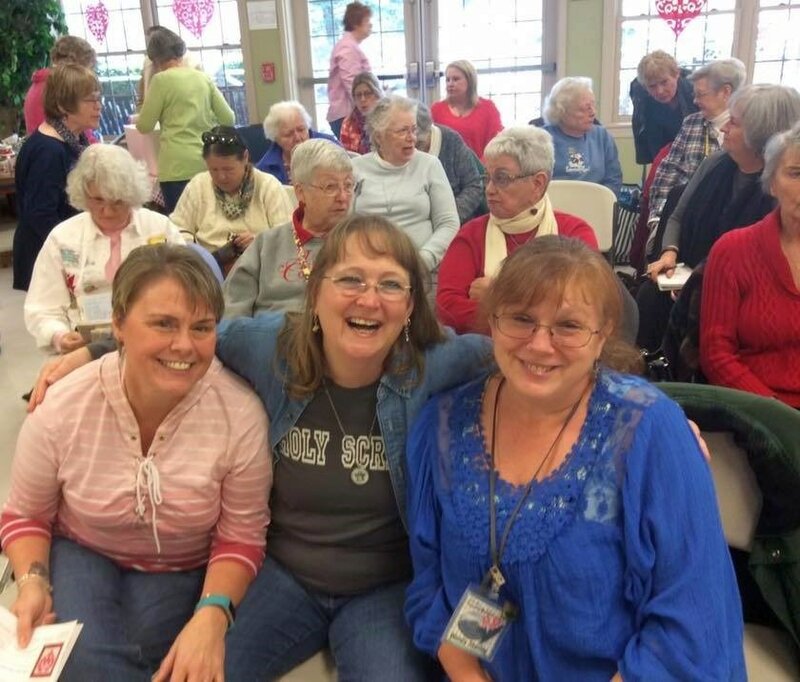 The Guild meets the second Thursday of each month with a social time at 2:00 p.m. and business meeting at 2:15 p.m. at the Ashe County Senior Center. The Senior Center is located at 180 Chattyrob Lane in West Jefferson. The meetings consist of a social time, business, Show & Tell, and a program. There’s a Sew Day on the first Thursday of each month at the Senior Center at 12:30 to give members a chance to work together on charity quilts and other projects. During the winter months meetings are canceled if schools close due to bad weather. In that case they are rescheduled for the third Thursday of the month. Benefits of membership include a monthly newsletter, membership directory, voting privileges, and participation in guild activities. We have educational programs & workshops, Sew Days, road trips, Secret Pals, a Quilt Fair, Challenge Quilts, Mystery Quilts & exchanges, Charity Quilts, and an Opportunity Quilt. Our goals are to educate, to preserve the heritage of quilting, to inform and inspire, to perpetuate a high quality of excellence in quilting and related arts, and to be a gathering for people with a common interest. We hope that you will participate and share your love of quilting with us. Welcome to our guild's site! This purple log cabin quilt can be found at the Ashe County Library during the month of April. "Rescued and Revived" is owned by Catherine Finch. She purchased the top at an art fair in Fort lowell Park in Tuscon, AZ in 1998. In 2016 she purchased the backing and binding and had it quilted by Todd Preston. This is a must see. Each year we raffle off a quilt. This year our fundraiser quilt was won by Candace Jones from Creston. Here quilt mothers Paula Riggs and Faye Marten, along with quilt makers/designers Ann Becker and Jennifer Ley, present the quilt to Candace. Ces Robison, guild president, presented a dozen quilts, 65 stuffed stockings, and a monetary donation to Glenda Luther representing Ashe Services for Aging. Our holiday community service project for 2018 was to make small stockings that were stuffed with goodies for some of our needy seniors in the area. The project is to provide new quilts to people on the North Carolina coast whose homes were severely damaged or destroyed by Hurricane Florence, the floods that followed, and then additionally damaged by more flooding from Hurricane Michael. This will be a long term project, lasting until at least June of next year, and likely longer. It takes a year to rebuild many homes, and quilts will be needed for quite some time. Carole Carter, from the From My Carolina Home blog, will be our guest speaker at the March meeting. She will be collecting quilts for the project at that time. You can donate a quilt that you created, one that you are not using, crochet an afghan or buy a blanket. Charities will take any size. If you or your group cannot make an entire quilt, please consider making a few blue & white Jacob's Ladder blocks and sending them to Kathy Carpenter. Use any blue you like. Use any white, off-white, or white with a small print that you like. Please be accurate so they will match blocks sent in by others and she won't have too much trouble putting them all together. They should measure 12.5" unfinished. Hey, you Snow Birds! This means you can participate, too! One Fat Quarter of white and one of blue will make two blocks. The Fundraiser Quilt at the Church of the Frescoes Festival October 13th. The Fundraiser Quilt at the Art on the Mountain event September 22nd. 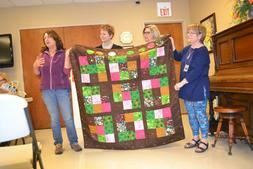 The 2018 challenge was to create a quilt that depicts one, or more, of the four seasons in Ashe County. Here are the results. Welcome our new slate of officers for the year 2018-2019. From L-R. Vice-Presdient Doris Phillips, Secretary Donna Sense, President Ces Robison and Treasurer Lynda Harris. A big thank you to our out-going officers. From L-R. Treasurer Betsy Zirolli, Vice-President Faye Martin, President Paula Riggs and Secretary Donna Sense, who will continue on. Vicki, standing, was the installer. The Fundraiser Quilt at Fiber Arts Day at the Farmers Market on May 26th. The 2018 Marathon Jam was on May 19th. This is a fundraiser for Fisher House at Fort Bragg, NC. Fisher House is a place any veteran, service person, and/or immediate family can stay free of charge while being treated/cared for at the Fort Bragg Medical Hospital. At this event, approximately 15 quilts were given to veterans. Enjoy these photos of quilts we had on exhibit at the Ashe County Arts Council during the month of February. 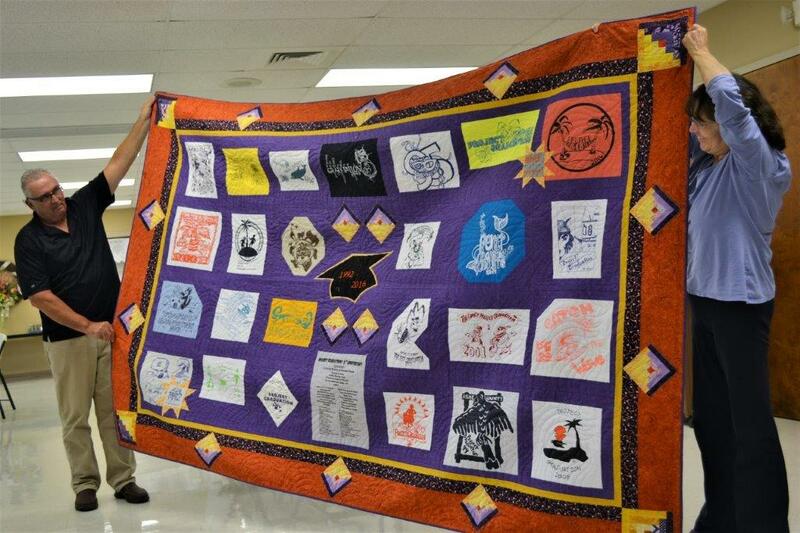 The quilt guild partnered with a middle school academic intramural club to create this beautiful quilt. 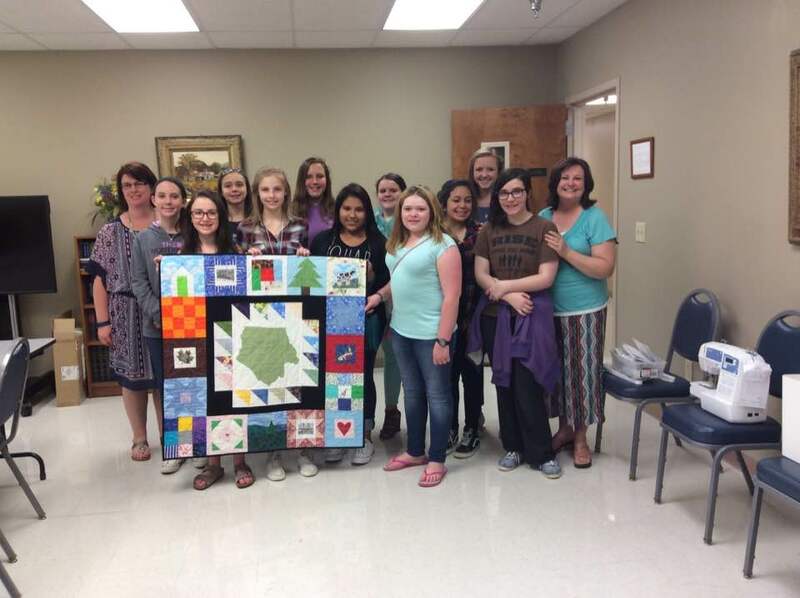 Each of the 16 girls made a square that depicted a different aspect of Ashe County. 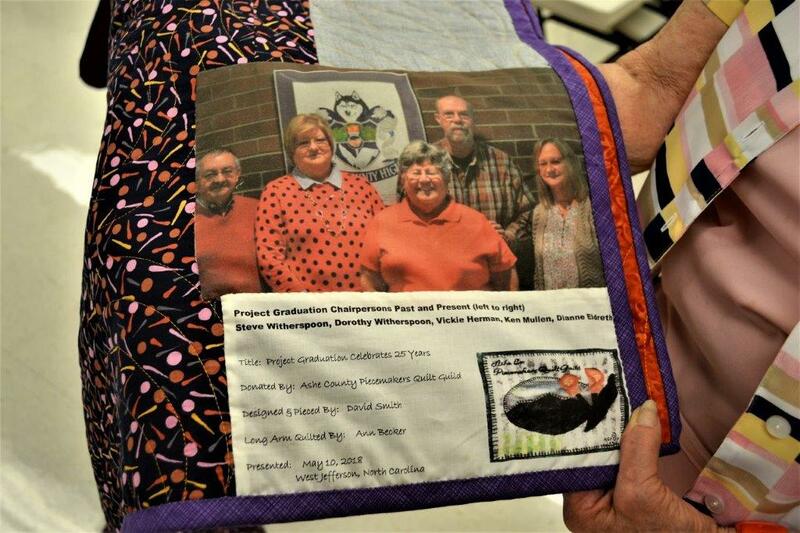 Part of their club experience was learning about the rich and unique heritage of the county, and the quilt was its culminating activity. The club was led by teachers Ms. Richardson and Ms. Aldrich. 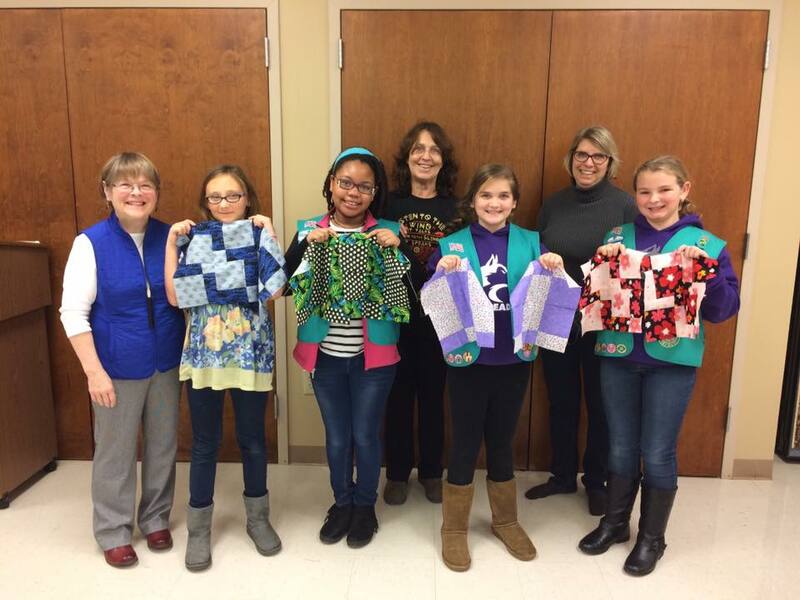 Kathy Carpenter taught the girls how to use a sewing machine and sew a quilt square. She put the squares together and presented it the club members. 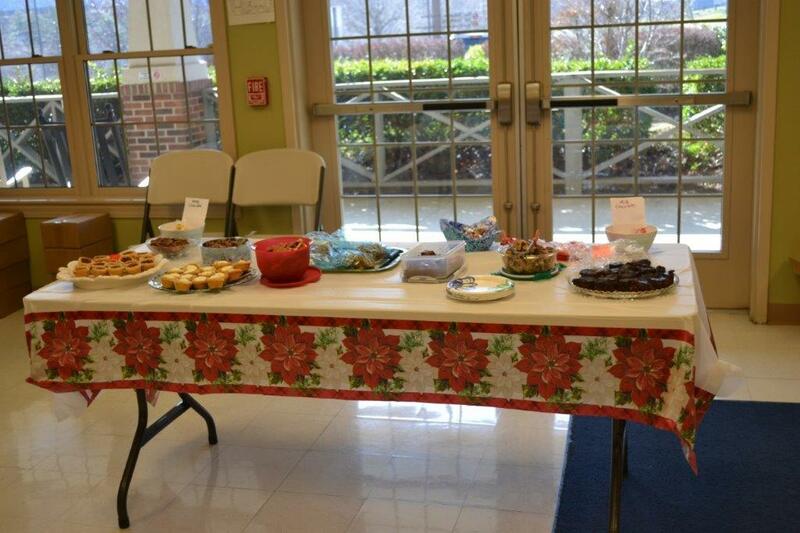 A grant from Blue Ridge Electric enabled the club to purchase a new sewing machine and fabrics. Brenda Shofer donated this quilt to the girl scouts. Bonnie K. Hunter, author and professional quilter, was at our February Guild Meeting. 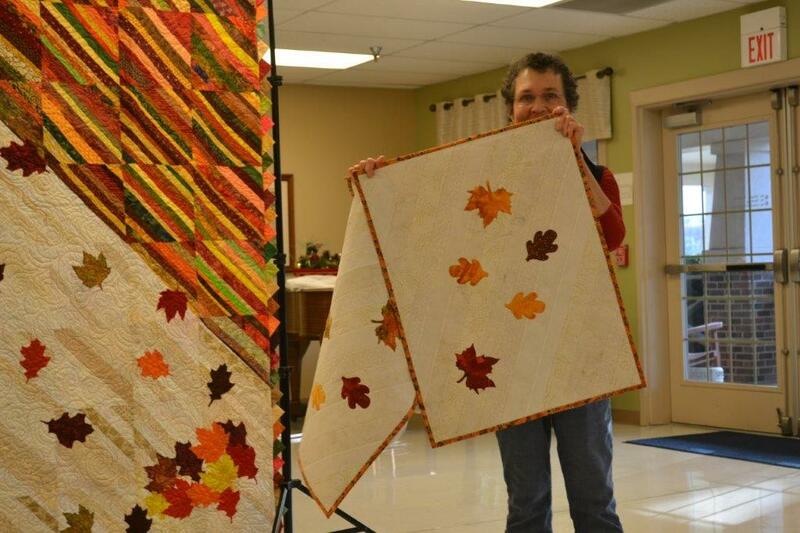 She has a home in nearby Grayson County, Va. Read about her visit in her blog, Quiltvilles' Quip's and Snips! Here is their finished quilt. Great job girls! We are on Facebook. Check us out! To see some of the recent activities we have been involved in, click here.